Quitting Coffee & getting through the day on my own energy and resolve. It’s Monday as I write this post, my seventh day of coffee-reduction, my fourth day of NO caffeine. I read Vesperlight’s comment too late and decided last Friday to go caffeine-free with no substitutes, no green tea, no Yerba Mate, no chocolate! I did not, however, limit other comfort foods and found much solace in a large serving of McMenamin’s tater tots Friday night. Sharing them with my husband, I discovered that he’s quitting coffee with me. I encouraged him not to do it, but he wants to be supportive and also to prove to himself that he doesn’t depend on coffee. I thought he’d have no trouble. He drinks only one cup each morning and has a bit more on the weekends. To my surprise, he felt gloomy and tired all weekend, growling at every happy couple he saw walking together with coffee cups in their hands. A normally sweet and dignified man, he was like The Wolverine at the sight of their to-go cups and carefree expressions. I worry about how he’s getting through the day today—it is Monday after all, the day most of us most need a little comfort to ease us back into the work world. On Wednesday, my second day of reduced coffee, I bumped into a book that aligned with my doctor’s advice and confirmed my suspicions about “The Exhaustion.”  In Brendan Brazier’s book “Thrive”, he explains that caffeine stimulates the production of cortisol, which I think is like adrenaline. A cup now and then may not be a problem, BUT know that a day or two later, there will be fatigue, and you’ll need to take time to recover and repair. 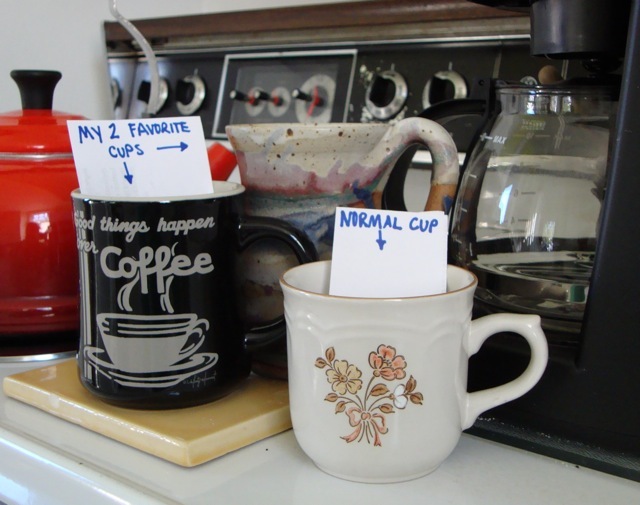 That’s my problem--as soon as I feel any “down,” I brew another cup. This level of caffeine intake over a long period means the body is running on adrenaline/cortisol for everyday functions, kind of like making me jog in place when I could be standing still. Not allowed to recover, the body eventually gives out, “The Exhaustion” in my case. I really want to know what it’s like to get through a day on my own energy and resolve, not mitigated by caffeine propelling me into each task with tenaciousness. Not every task requires tenaciousness. Why run when I could walk? Remembering why I’m doing this is helping me through the withdrawal. I’ve done some research which I’ll share in a later post, but caffeine withdrawal is a real ailment, and my symptoms are common. Thank goodness. After quitting yoga class halfway through Thursday morning, I came home and fell into a fit of tears as I made breakfast. I hardly ever cry, and never have I cuddled up to the refrigerator for support. I have to admit, its motor’s steady hum helped. I managed to finish the cereal then slept most of the day—deep, dead-like slumber. Depression and fatigue are common symptoms of caffeine withdrawal. By Friday, all the symptoms had dulled—a vague tiredness, a hazy headache, dry mouth. However, by late afternoon, I felt sure my face was changing shape. My right cheek shifting upwards, eyes bending toward each other, everything sifting counter-clockwise. Today, most of the physical withdrawal symptoms have faded, but the psychological ones are kicking in. I craved coffee for its company, its companionship, its camaraderie. I needed it to “get going,” even though the fatigue is almost gone. I wanted its company and could not motivate myself to get to work until almost noon. I even let myself turn to a substitute—caffeine free cinnamon tea with soy creamer. It helped—a warm mug to hold, creamy texture, and the cinnamon kick-started my brain a little. If the absence of coffee can cause such physical, mental, emotional reaction, should I drink any of it at all? My goal had been to free myself of the addiction, then train myself to have one normal-sized cup now and then, not even every day. Now I wonder, should I even have that now-and-then coffee? How can I not? I want to sip the brew with my cousin and my mom and talk about our gardens, our craft projects, and our lives as women with endless ideas, a lot like TravelGirl commented. Well, first things first. I must break the addiction. Apparently, it takes an average of four days of no caffeine to get it all out of my system and relinquish me from its grip. I made plans weeks ago to meet a friend for coffee on Wednesday, which would be day six of no caffeine. Should I have a cup? Maybe I’ll order a de-caf.